Want an easy-peasy weeknight meal your whole family will enjoy? I bet you’re saying yes, yes, yes! Well, read on, because my whole family loves this pasta and I love it because it’s tasty of course, but so quick (under 45 minutes) and easy to make. This is definitely a family and kid friendly meal. It’s cheesy, hence the title, cheesy baked tortellini. This pasta is rated a 10+ in my house and has quickly become a family favorite. Life is getting busy around our house, and during this busy time I have to prepare my weekly dinner menu in advance. Zoe now has lacrosse, dance and cotillion 4 nights during the week so goodbye (for now) to sit-down family dinners, and hello make ahead and easy meals. On Sundays, I put together a list of potential weeknight dinners and I also try to cook a two-nighter meal as well. When life is busy, I don’t want to compromise on eating nutritionally, nor do I want us eating takeout every night. I want to offer my kids their veggies and a fairly balanced and nutritious meal. To accomplish this, I try and find recipes that I can either make ahead, that will provide dinner for 2 nights or ones that can be put together in a flash. 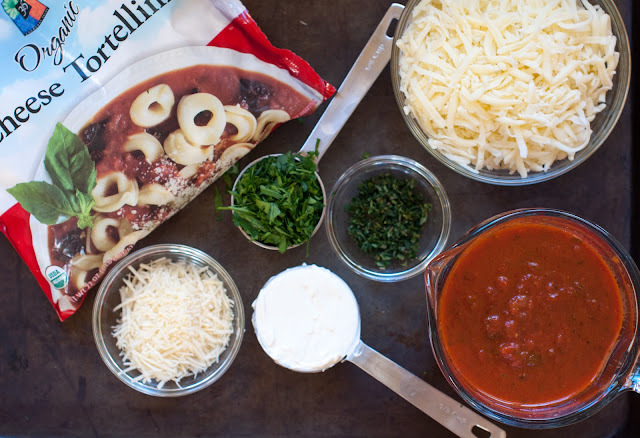 This tortellini pasta matches all three of that criteria. You can throw it together in less than 45 minutes. You can also make it earlier in the day, cover it with foil, refrigerate it and then re-heat later that evening. Oh yeah!!! I’ll be honest with you all and let you know that we end up using a jared sauce the majority of the time. I don’t always make the homemade marinara sauce, and that’s ok! My favorite jarred sauce to use for this pasta is Rao’s homemade Marinara. 2 cups marinara sauce – store bought or homemade – I made a homemade version from Giada the day before- recipe to follow below. I have also made this recipe a number of times with different store bought sauces and my basic tomato sauce. shredded mozzarella or smoked mozzarella cheese, – The recipe called for 2 ounces, but really, who measures out their cheese? Just top your dish with the amount of cheese you want. Bring a large pot of salted water to a boil for the tortellini. Lightly oil an 8x8x2-inch baking dish or 4 individual gratin dishes. Below is what mascarpone cheese looks like. It resembles a soft cream cheese. In a large bowl, mix together the marinara sauce, mascarpone cheese, parsley and thyme. It’s best to mix everything with a spatula because you’re going to have to press the mascarpone cheese against the sides of the bowl to get it to soften up. When the pasta water comes to a boil, cook the tortellini until just tender or al dente, about 2 minutes. I used frozen tortellini and the 2 minute cooking time was perfect. Drain. Add the tortellini to the sauce and toss to coat. Transfer the tortellini mixture to the prepared baking dish or dishes. Not a great photo, but you get the step involved. Top the tortellini with grated parmesan cheese and then add mozzarella cheese. Cover the dish or dishes with a tin foil (I actually use parchment as my first layer and then tin foil. Tin foil is not great to cook with, as it can leach aluminum into food, so I use the parchment as a protective layer between the tin foil and the food). Bake for exactly 20 minutes, then remove the foil and bake uncovered until the sauce bubbles and the cheeses melt on top, about 10 minutes longer. Note: The cheese will be melted, but will be white and bland in color. 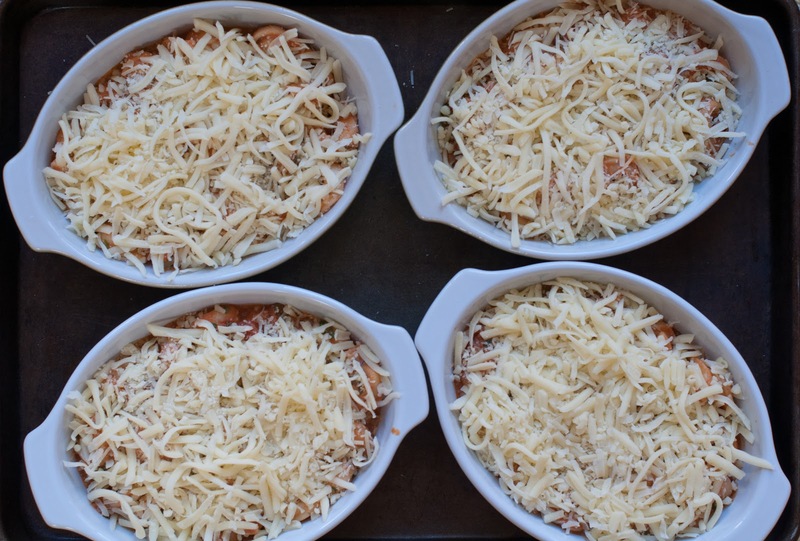 We like the cheese to brown up and get crispy, so if you want your cheese to be browned and crispy, then turn on your broiler and place the pasta under the broiler for a few minutes until the cheese browns up. That is it folks! How easy was that dish to prepare? I always pair this pasta with a big green salad or some roasted broccoli. This dish is a two-night meal for the kids and I and then some. Got leftovers (because you will): Just cover the leftover pasta in the pan you cooked it in, and store it in the refrigerator. Re-heat the pasta in the oven at 250 degrees till warm. I’m actually re-heating up their leftovers as I write this post. Here they are eating their leftovers! Happy as clams! If you want to make your own marinara sauce then you can follow along with me below, if not, I get it! This marina sauce is great because it can be made day ahead of time, and it’s fairly easy to whip up. The only thing that really takes time is chopping up all the veggies. This is a wonderful marina sauce that you can use as a base for just about any Italian meal. In a large pot or dutch oven, heat the oil over medium-high heat. Add the onions and garlic and sauté until the onions are translucent, about 10 minutes. Add the celery, carrots and 1/2 teaspoon each of salt and pepper. Sauté until all the vegetables are soft, about 10 minutes. Add the tomatoes and bay leaves, and simmer uncovered over low heat until the sauce thickens, about 1 hour. Remove and discard the bay leaves. Season the sauce with more salt and pepper to taste. Let the sauce cool, and then refrigerate or freeze it. This sauce freezes very well, so I saved 2 cups for the above recipe, and froze the remaining amount for a later date. The sauce may be stored frozen for up to 3 months. If you don’t want to make your own sauce, use your favorite store bought brand. I hate to admit it, but it what I typically end up doing! 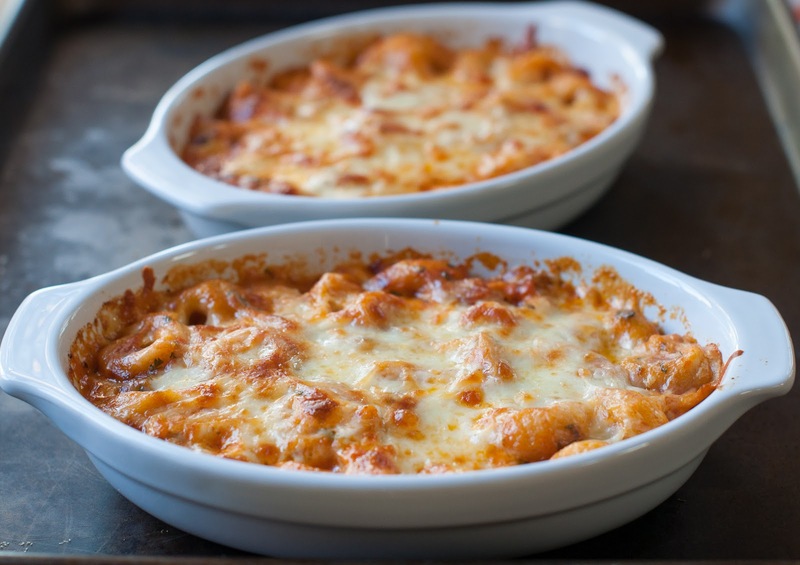 I’ve been reading through dozens of baked tortelini recipes and yours looks perfect! Ouf dinner this week. Thanks! You made all these within 45 min! Sounds like this is the kind of recipe that I need. I have not watch Giada de Laurentiis cooking program but have heard about her thru food network. She seems to be very popular in America and would love to try some of her recipe. This will be a good start for me. Hi Zoe! Yes, 45 minutes, can you believe it? If you have marina sauce then you can just throw the rest together. The marina sauce is what takes some time to make, but I may just use my favorite jared variety next time. This recipe was really for the kids. I have been making some recipes lately that have not been a hit with them and luckily this one hit the mark! Made this tonight! Previewing some recipes that I can make ahead for when baby #2 comes in October (2 in 16 months…we are going to be busy!) First time I made tomato sauce-no more Prego for us! This was much healthier and tasted so much better. I also added in some fresh spinach from the farmer’s market into the sauce and used some leftover ricotta instead of the marscapone cheese. Amazing-and one of those vegetarian that don’t taste vegetarian kind of meals! So glad you enjoyed this dish. Its super easy and great for those busy weeknights. Congratulations on baby number 2. You will definitley have your hands full for a while, but what fun it all is. I was looking back on old photos the other night wondering where the years have gone. I can’t believe that my daughter is 12 and my son is 7. The years go by to quick so enmbrace the chaos! I’m using it today for dinner tonight! The kids are getting this, and the grown-ups are getting lamb chops – but we might have to steal from the kids. I made it in advance and it was remarkably easy – love it! Hi Grier! How did it turn out? Did the kids like it? This looks amazing. 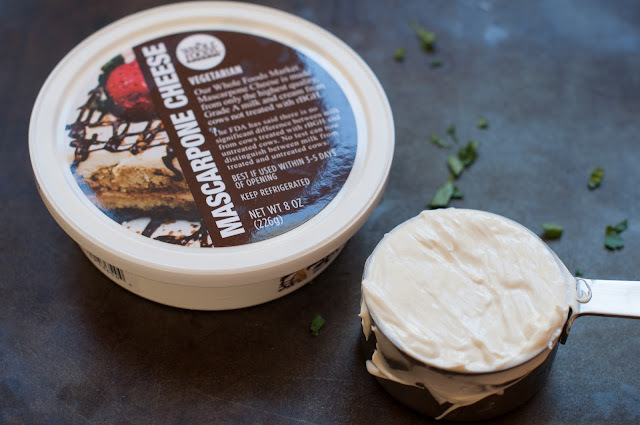 I love using mascarpone in sauces and I love the individual dishes! Have a great weekend! oh my but this looks good! I love the individual portion dishes too. How cute in the individual dishes! Hey pretty lady! Those kids are ADORABLE!!! Looks like Im going to need to learn like pasta a bit more I have kids (IF I have kids) right…!? Louis is probably counting down the days – he LOVES pasta and we never ever have it ,poor boy (although still got your fennel sausage one in the pipeline!). I do however LOVE smoked cheese. Louis and I went to stay on thsi organic farm in Italy last summer (bliss!) and visited a local shepherd and ate freshly smoked sheeps ricotta – it was AMAZING!!! Hi Em! I know, we do eat a lot of pasta in this house, but it’s so easy and versatile and my kids love it. Pasta is the one dish my kids do not get tired of eating. I don’t eat as much pasta as them though. While they had leftovers last night I had a soup and salad. So you can feed Louis and your kids (yes, you will have kids) pasta and you can eat your “mommy” food. Louis is such a good sport like my husband. My husband eats whatever I put on the table even if it’s a quinoa dish or some new strange vegan dish. He is from the midwest so he is at heart a meat and potatoes kind of guy. I love that he eats without complaint! This was my first time sampling smoked mozzarella and I really liked the flavor it gave to the pasta. That farm in Italy sounds amazing and something I would love to do someday. Someday when my hubby has more time off of work and we have the means to travel at our leisure. Hi Amanda! I think your kids will love this as our kids seem to like the same things! Let me know how it turns out. Off to do the dreaded stairs with Wendy! Ugh! So gonna try this!!!!!!! Looks fab! !